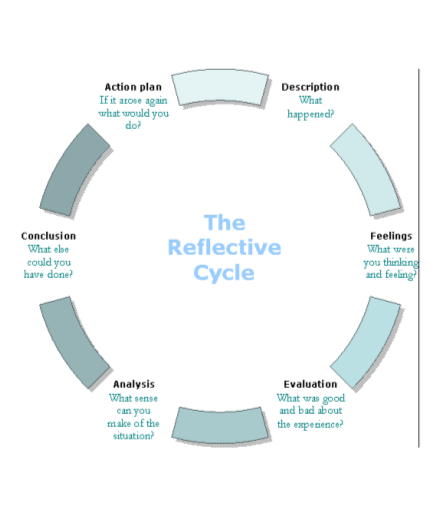 The development of reflective skills is a key element of personal and professional development for nursing and healthcare staff (Smith, 1998). However, it is important to be able to develop effective skills in reflection, which incorporates much more than simply reviewing incidents, but forms part of a process of ongoing development of self awareness and insight into the actions of self and others (Rolfe et al, 2001). According toJones (1995), reflection is also an important part of developing clinical skills and understanding the relationship between evidence and quality of healthcare practice. This means that reflection is also part of professional development and provision of the best possible standards of care (Gustafsson and Fagerberg, 2004; Higgs and Titchen, 2001). Some authors suggest that reflection is both flawed and biased, and because of this, is not necessarily a useful activity, but this is usuall because if reflection is not focused properly, it does not achieve what it is supposed to achieve (Burnard, 2002). Any reflection could be poentially biased, as it is an indiviudal and personal action applying critical thinking to essentially subjective experiences (Jones, 1995). However, the value of reflection has been repeatedly demonstrated in the literature as providing elements of personal development through insight and learning, and professional development, through reflecting on own practice in the light of ‘best practice’ (Cottrell, 2003; Gibbs, 1988; Schon, 1987). Reflection often focuses on distinct elements of nursing experience, such as critical incidents or significant occurrences within clincal practice (Minghella and Benson, 1995; Smith, 1998). This kind of reflection is important to allow nurses to understand the experience and their own role within the case, and to consider how to change their behaviours to improve future practice (Gibbs, 1988; John and Freshwater, 1998). It is this capacity to change and improve practice which is the real value and goal of reflection (Rolfe et al, 2001). This essay focuses on an experience caring for a patient with a spinal injury, who was immobile and had suffered incontinence of faeces, which required nursing care to assist with personal hygiene. The chosen model for the reflection is Gibbs(1998) model (see Appendix) which is a cylical model which allows for a review of the incident and an evaluation of the experience, followed by development of a plan for future practice improvement. In this element of the model, Gibbs (1988) encourages the practitioner to describe the incident, to say what happened. In this case, the patient was immobile within an acute hospital facility, had been incontinent of faeces, and was, understandably, upset and embarassed by what had happened. In particular, the patient, who was a young adult male, was very aware of the odour. I assisted the qualified nurse in attending to his hygiene needs, using appropriate manual handling equipment. The patient was upset by the experience. Simply by describing this incident in a few lines, I have been able to highlight key elements of the incident which start to emerge as important for considering future practice. In this element of the Gibbs (1988) cycle, the practitioner is encouraged to describe how they were feeling. In this case, I was also embarassed, and made even more so by the awareness of the faecal odour and the fact that this was a young male, who was being given a bed bath by two women. I also felt very ‘sorry’ for the young man, who was immobile due to an accident and spinal cord injury. Here, reflecting on my feelings makes me realise that my feelings may have been transmitted to the patient, and that a professional approach is needed because the patient is already embarassed and self-conscious. I was aware that we had a lot of power, because the patient could not help himself, and that how I behaved was important in reducing the effect on the patient. In this element of the reflective cycle, the practitioner is required to consider what is good and what is bad about the experience. In this case, it was good that working with an experienced nurse, the whole procedure was managed swiftly and professionally, and that communication with the patient was maintained throughout. The qualified nurse had cared for the patient before, and they seemed to have a good nurse-patient relationship. Her manner was professional but warm, not patronising. The negative parts of the experience included my own feelings getting in the way of my professional relationship with the patient, and the fact that I am sure he was aware of my reaction to the situation. This is the key section of the Gibbs (1988) cycle, because it encourages the nurse to analyse the situation, and it is here that critical analysis skills come to the fore. In relation to caring for a patient in this kind of situation, the complexity of the emotional/psychological and personal dimensions of the patient’s experience means that professional approaches to their care are very important (Slater, 2003). The use of different hygiene aids and approaches, such as, for example, planning to ‘check’ for hygiene needs very frequently, might assist in preventing this situation occurring. However, as a junior student, I was not really aware of what other options there might be. Further discussion with my mentor revealed that the patient had been considering a stoma bag, because this would give him some control over managing faecal incontinence and would allow the patient some independence. The patient was paraplegic, not quadraplegic, and would, with the stoma back, be able to manage his own hygiene needs in relation to bowel function. The implications of this kind of surgery would be considerable. I didn’t realise until after the incident, whilst discussing it with my mentor, that this was on the patient’s mind, and that much of his response to the situation was due to frustration and that these experiences were contributing to his desire to have surgery to have a stoma formed. This section of the reflective cycle asks the nurse what else they could have done. In this situation, I think I could have perhaps discussed more of the patient’s case with the nurse prior to the incident, or could have asked the patient, sensitively, what we could have done to support him better. I could also have spent more time considering the kind of impact that spinal cord injury would have on a young, otherwise fit man, in terms of the social impact, and the lack of independence. Certainly I had never considered major surgery as a means of providing some personal independence. Be aware of my own emotional responses and try to act more professionally. Listen to the patient and encourage them to talk frankly with me. Spend more time after even seemingly innoccuous incidents talking with my mentor about cases, to become more aware of the complexities of patient experiences. This reflective cycle has provided me with a deeper insight into a situation which for me, was at first all about my response and feeling sorry for the patient. Gibbs (1988) provides a good cycle for reflection, because it moves the individual on towards changing their own practice, not just becoming aware of it. Gustafsson, C. and Fagerberg, I. (2004) Reflection: the way to professional development? Journal of Clinical Nursing 13 271-280. John C and Freshwater D (1998) Transforming nursing through reflective practice Oxford: Blackwell Publishing. Jones, P.R. (1995) Hindsight bias in reflective practice: an empirical investigation. Journal of Advanced Nursing 21 (4) 783–788. Minghella E, Benson A (1995) Developing reflective practice in mental health nursing through critical incident analysis, Journal of Advanced Nursing, 21, 205-213. Rolfe G, Freshwater D, & Jasper M (2001) Critical Reflection for Nursing and the Helping Professions: A User Guide. New York: Palgrave Macmillan. Slater W (2003) Management of faecal incontinence of a patient with spinal cord injury. British Journal of Nursing, 12(28), 727-734. "Reflection on Uncomfortable Experience – Bed Bath." UKEssays.com. 11 2018. All Answers Ltd. 04 2019 <https://www.ukessays.com/essays/nursing/reflection-uncomfortable-experience-bed-4410.php?vref=1>. "Reflection on Uncomfortable Experience – Bed Bath." All Answers Ltd. ukessays.com, November 2018. Web. 18 April 2019. <https://www.ukessays.com/essays/nursing/reflection-uncomfortable-experience-bed-4410.php?vref=1>. UKEssays. November 2018. Reflection on Uncomfortable Experience – Bed Bath. [online]. Available from: https://www.ukessays.com/essays/nursing/reflection-uncomfortable-experience-bed-4410.php?vref=1 [Accessed 18 April 2019]. UKEssays. Reflection on Uncomfortable Experience – Bed Bath [Internet]. November 2018. [Accessed 18 April 2019]; Available from: https://www.ukessays.com/essays/nursing/reflection-uncomfortable-experience-bed-4410.php?vref=1.